Payment is due in full at the time of purchase, prior to shipping. PayPal, Visa, Mastercard, Discover and American Express, or Unicorn Crafts gift certificate. Your purchase will be sent to the address provided at checkout. Please make sure that this address is up to date and correct before submitting your order. You will receive a notification when your order has shipped. If listed shipping address is incorrect and the package is returned, your order will be refunded minus the shipping costs if the merchandise is returned without damages. Should you request the order be sent to a different address, please be aware that you will be charged an additional fee for shipping the package twice. All shipping charges are per address. Customers are responsible for any fees, taxes, and duties associated with purchasing & shipping to their respective countries. In order to offer affordable international shipping prices, most international orders are shipped via First Class Mail International. Please keep in mind orders can take up to 3 weeks to arrive. Please reference individual products for current shipping lead times. All sales are final with the exception of returns due to damage, defective product, or wrong item shipped. Claims for missing items or items damaged in transit must be received within 48 hours of receipt of merchandise. The items will be exchanged and/or a replacement sent. Shipping will not be charged for exchanged items as a result of damage, defective product or wrong item shipped. If at any time there is a problem or you are unsatisfied with your purchase, please contact us to resolve the issue. We strive to make every customer happy and your satisfaction is extremely important to us. To make a claim or contact customer service, please visit our contact page. By making a purchase at www.unicorncraftsart.com you agree to these terms and conditions. For purposes of EU data protection law, I, Faheema Chaudhury, am the data controller of your personal information. 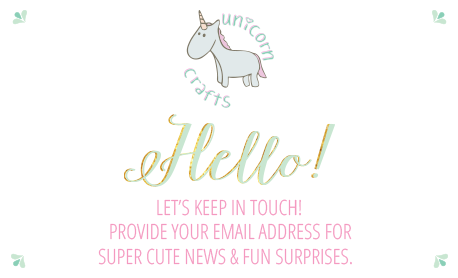 If you have any questions or concerns, you may contact me at hello@unicorncraftsart.com.